This morning I headed into town for my regular contact lens checkup with the optician. Thankfully, all is well with my eyes, except of course for being as blind as a short sighted bat if I don't have either my glasses on or my lenses in. While I was there, I poked around in the sales until I got bored with the sameness of it all. I didn't think too much of the pickings although if I was super skinny, i.e. a size 6, I'd have had plenty of choice. I eventually came home (OK, I did pick up a cardi - it was made of alpaca and just called to me with it's softness - and two pairs of trousers, but at the silly prices on offer I'd have been remiss not to take advantage) and I'm sitting here, typing away, sipping tea and trying to defrost (it is bitter out there). 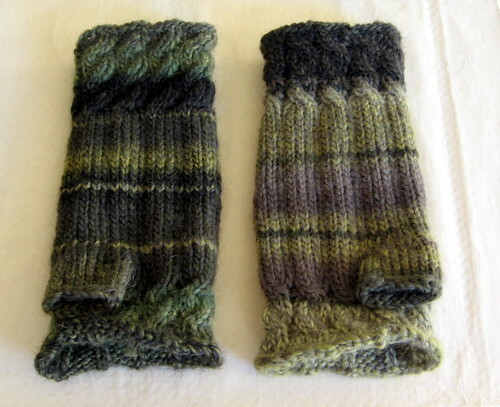 These are Fetching, the elder sibling of Dashing (posted about yesterday), also from Knitty and made entirely for me! That sentence required an exclamation mark as this is only the second project I've finished this year intended entirely for yours truely. They're modelled here by Dave, who I had to fight to retain possession of these gloves. 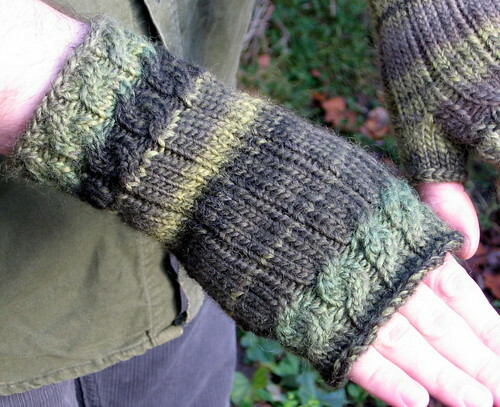 The more feminine version they might be, but I was informed that when knitted in mossy green they're 'manly' and Dave has a keen eye on manly knits, considering them to be automatically for him. I used up about 3/4 of a 100g skein of Katia Azteca in colourway 7803 (Ravelry Link) which I picked up during last Christmas's trek to Penzance. I love the way the colour worked out, although it did mean that I've ended up with two gloves which while they're definitely related are in no way identical. Katia Azteca is an underspun aran weight, 50% wool and 50% acrylic. These mittens were knitted on 4mm needles (as per the pattern) which resulted in a thick, dense fabric, which I have to say (since I'm sitting here wearing them as I type) is very warm and cosy. Added an extra set of cables at the cuff. Added an extra five rows of rib between the cuff cables and the thumb. Added an extra set of cables at the knuckle. Used a standard bind off rather than the picot bind off listed in the pattern. Added an extra four rows to the thumb. These changes were mostly to accommodate my hands, which are long with equally long, artistic and crafty fingers. 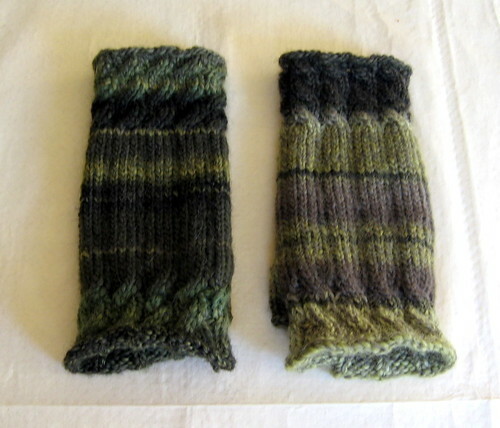 I wanted each mitten to be tighter across the knuckle as well as a little longer, so they almost reach the first joint in my fingers, rather than stopping at the knuckles as in the pattern. Once I'd lengthened the bit coming over the fingers, I needed to lengthen the thumb as well to balance things out. I ditched the picot bind off after reading other knitters comments on Ravelry; the consensus of opinion was that the pattern as written gave a loose fitting mitten across the knuckles, with the bind off designed to flair out in a lady like fashion. Lady like is all very well, but I've knitted these gloves to keep my hands warm while allowing me to retain the use of my fingers, so I decided on a conventional bind off... And I must say I'm very happy with the result. I even like the way the thumb sits on these mittens, even though it was constructed in exactly the same way as the thumb on Dashing, it just looks so much more balanced... Like it was meant to be there, rather than having be stuck on as an after thought. 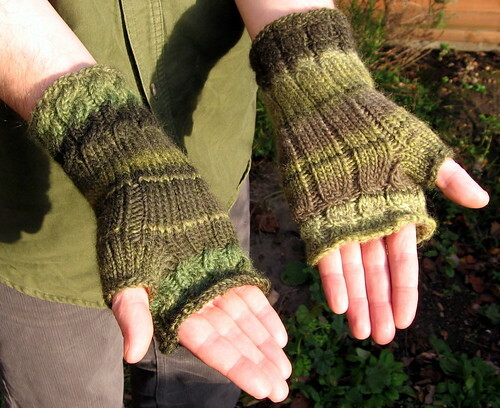 One day I will learn how to knit fingers, but in the meantime, I am a happy knitter with toasty hands. The green ones suit Dave more than the red, although I'm sure they suit you too. I think these ones look better :-) yay for warm and toasty. You surely can't be far off a size 6 madam, I certainly don't think of you being much bigger than an 8 at the most. BTW how did you get blogger to let you use an !, it only ever lets me in the comments section? Wonderful I think I like those best and they do look good on Dave but you should keep hold of them and beat him off with a stick if needed ! I made a pair for my auntie for Christmas, in the Debbie Bliss stuff, which I got on sale. They came out very well and she loved them. 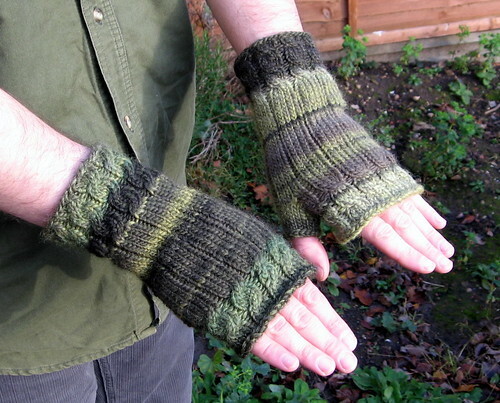 I'm currently making myself a pair as well in Sirdar something or other. When I'm doneI should still have enough to make a matching cabled panta. They're green, so obviously you're a trend setter.